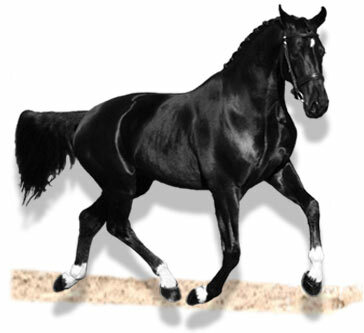 100% GERMAN BLOODLINES, OLDENBURG/HANOVARIAN OF DONNERHALL, RUBINSTEIN, DE NIRO, WENZEL I.
Donnerubin’s 100% German Bloodlines are simply phenomenal. Donnerhall and Rubinstein need no introduction as proven performance sires of both Olympic and World Championship progeny. They are both truly the great Dressage Sires of all time. But now the combination of their two lines has left breeders all over the world breathless. Donnerubin’s famous dressage lines don’t stop there, also boasting dashes of De Niro, Akzent II and Wenzel I (a close relative of the third great sire Weltmeyer). Simply put there isn’t a weak line going back 5 generations. Donnerubin himself is a real credit to his world famous Grandsires. But bloodlines are not everything. It’s Donnerubin’s kind temperament that makes him unique in any horse let alone a Stallion. His level headedness and eagerness to please, all passed to him from his Sire, makes him a truly trainable horse, a crucial factor for competitive success. His showclass looks and conformation are a bonus, but it is the rare phenomenon of having three outstanding gaits that makes him the perfect choice for breeding your future star in Dressage, Showing, Jumping or simply for pure pleasure.